After spending 3 weeks in a Rome apartment that fit the budget and in a good location, but definitely not luxury, we decided to treat ourselves to an anniversary night at the Fontana Hotel facing Trevi Fountain. A very nice day at the beautiful Bourghese Gallery discovering more Bernini masterpieces followed by a delicious dinner at a family trattoria and finishing with a stroll with some more tasty gelato. I am not sure how the Bella Donna in my life puts up with me, but I am happy for every day. 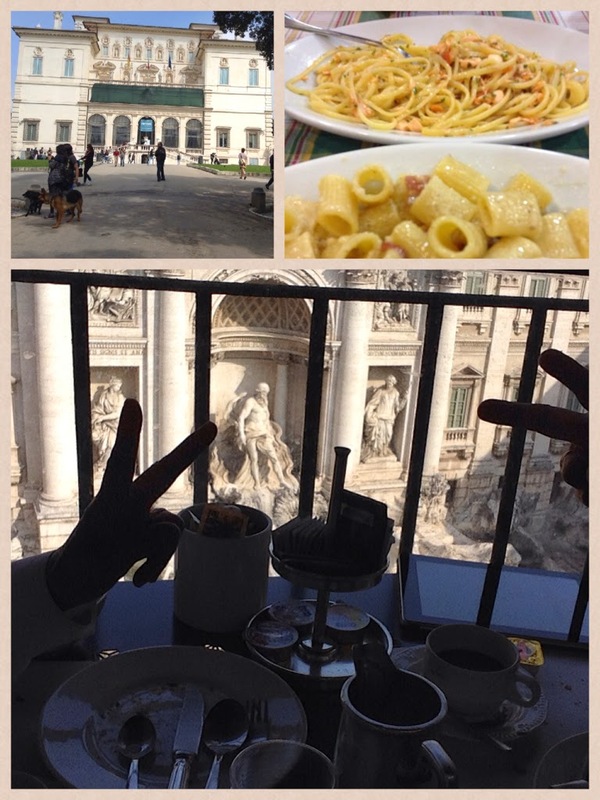 The Bourghese Villa, Linguine with Salmon, Pasta alla Grecia and breakfast with a view, Happy Anniversary. 32 years ago we did the traditional "throw the coin from your right hand backwards over your left shoulder and you will be guaranteed a return to Rome" It took us 32 years - but the legend was right - we returned, and for a lot longer! My bell'uomo, we put up with each other - but you will always be l'amore della mia vita! I was trying to show a view from our room when a Neptune wannabe got in the way. Then I read this about how Neptune was described: "The body is muscular inclining to fatness....."
The Trevi Fountain is the largest baroque fountain in Rome. The central figure is Neptune (god of the sea) planked by 2 Tritons - a young one that struggles to master a wild seahorse and an older Triton with a tame seahorse symbolizing the contrasting moods of the sea. To the right and left of Neptune are statues of Abundance and Health, and the 2 reliefs show Agrippa building the aqueduct and the other the Virgin lady indicating to soldiers where the source of water is. The Fontana del Pantheon, in the center of the fountain is an Egyptian obelisk. The fountain was constructed by Giacomo della Porto in 1575, and the obelisk was added to it in 1711. I love the backdrop of this fountain. The Fountain of the Naiads on Piazza della Repubblica. The center is Glaucus, the Water God surrounded by four naiads which represent the rivers, the oceans, the lakes, and the underground waters. This is said to be the most sensual fountain in Rome and of course Richard's favorite. 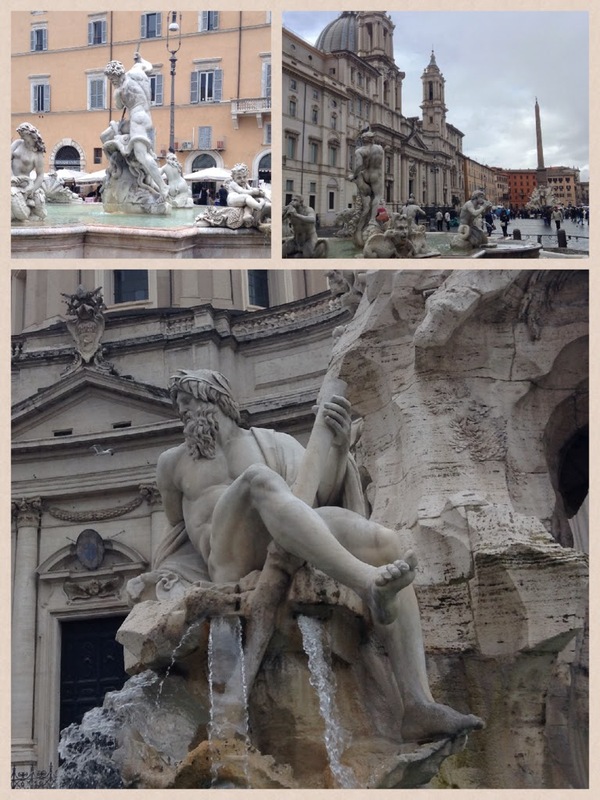 There are 3 fountains in the Piazza Navona. The Fountain of the Rivers by Gian Lorenzo Bernini (another Bernini - this beautiful fountain is my favorite), The Fountain of the Moor by Bernini and della Porta, and The Fountain of the Neptune also by Giacomo della Porta. 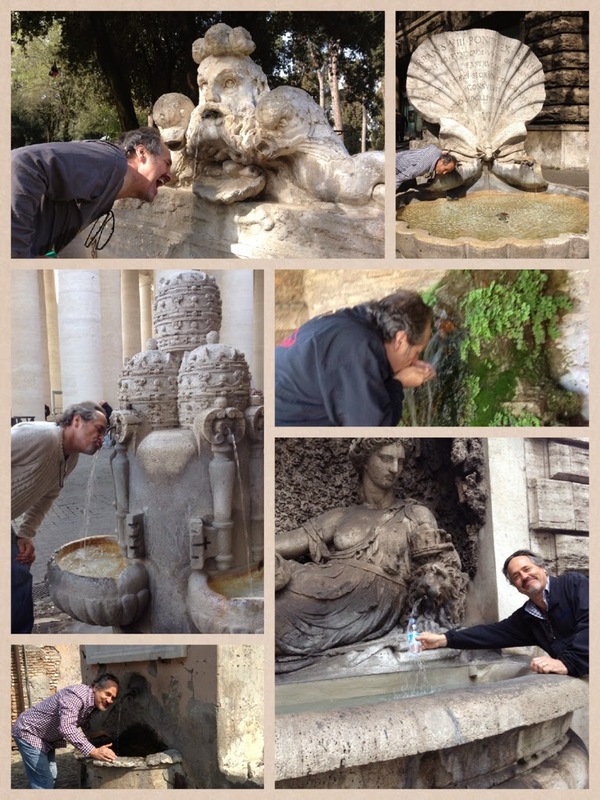 Of course, we can't overlook the 2,500 unique drinking fountains found all through Rome called "nasonis" The water is fresh, cold, and safe to drink saving money on buying bottled water! "There is a fountain of youth: it is your mind, your talents, the creativity you bring to your life and the lives of people you love. When you learn to tap this source, you will truly have defeated age"
"Look within. Within is the fountain of good, and it will ever bubble up, if thou wilt ever dig"